Office Direct wins CAP Services’ Business Expansion Contest – CAP Services Inc. 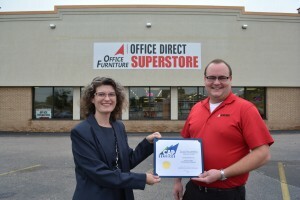 Standing in front of Office Direct in Stevens Point, CAP Services’ Laura West presents business owner Cole Corrigan with a certificate recognizing the business as the winner of CAP’s first Business Expansion Contest. CAP Services recently named Office Direct Interiors of Stevens Point the winner of CAP’s first Business Expansion Contest. Office Direct will receive a $1,000 cash prize, free marketing assessment, mentorship through the Packers Mentor-Protégé Program, and referrals for services specific to the business’s needs. “There are many business plan and business start-up contests available to new entrepreneurs so we wanted to find a way to support and celebrate growing businesses in our area” said Laura West, CAP’s Director of Business Development. Office Direct sells new and used office furniture and offers customers the option of buying pre-assembled products from their retail showroom or getting customized office furniture that fits their specific needs. Office Direct has established connections in the office furniture industry that allow it to offer competitive prices, transparency in the ordering process and reduced lead times on customized furniture. The business plans to expand the area it serves and open additional locations across the state. Office Direct was selected from four finalists. Any business within CAP’s five county region – Marquette, Outagamie, Portage, Waupaca, and Waushara – operating their business for two years or more with plans to expand their sales footprint was eligible to apply. Contestants completed a questionnaire about their current business operations and expansion plans. Applications were scored by five judges with economic development expertise. Four finalists advanced to a second round of scoring where they presented their business expansion plans in person, giving the judges a chance to ask questions and learn more about the business’s expansion plans. Contest partners include Fox Valley Technical College, Venture Centre, 1 Million Cups, Fox Cities Regional Partnership, UW-Oshkosh Small Business Development Center, City of New London, New London Economic Development, City of Waupaca, Waupaca Economic Development, New London Area Chamber of Commerce and Waupaca Area Chamber of Commerce.